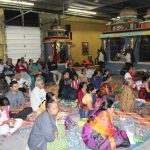 After the discourse series at the DFW temple in Dallas on Sri Krishna Sharanam Mama, the devotees were yearning to hear more on Bhagavatha Dharma. Shri.Ramanujamji didn’t make them wait any longer. 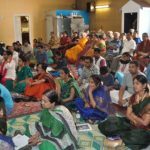 The three day discourse series on Inner Transformation through Bhagavatha Dharma, started on Friday November 29th 2012 and concluded on Sunday, December 1st 2012 at Sri Karya Siddhi Hanuman temple. Sri Ramanujamji started by explaning the term ‘Dharma’ and ‘Bhagavatha Dharma’. He then gave a succinct summary about Bhagavatham explaining how it came to be and that it is not to convince anybody of anything but just for everyone to enjoy. Sri Ramanujamji beautifully defined the two types of Dharma as given by Mahans. When mind wanders towards self/worldly things, it is called Pravruthi Dharma and when its towards Lord Krishna it is is Nivruthi Dharma, and exhorted the devotees that one needs to follow the latter path. Then Shri.Ramanujamji explained about the story depicting a Bull as Dharma and Cow as earth. When Parikshit Maharaj saw the wounded bull with three broken legs and the cow injured severely he could not believe his eyes. When he saw the wrong-doer, he challenged him only to find him,’Kali’ surrender at his feet. The inner meaning of this story is, Kali even though formidable when faced with faith can be won over. The four legs of the bull (Dharma) are Tapas (Penance – senses under control), Soucham ( Internal and external purity), Daya – Compassion and Sathyam – Supreme Truth. The first three were broken during Kali but the fourth one was not broken. In Kali even though the cause of misery is manifold, the path to Bhagavan becomes easier and Nama sankirtan is the way to Bhagavan. Kali is found in places where gambling, adultery, intoxication, cruelty and gold (animosity) are present, hence the easiest way is to stay away from these and chant the sweet names of Lord Krishna. 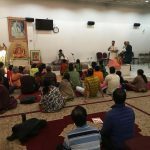 On the second day, the discourse started with Shri.Ramanujamji expounding on the attitute of gratitude. Srimad Bhagavatam is a fruit of gratitude, right from Sukhamuni who was grateful for reuniting with his father told Bhagavatham to King Parikshit who was also grateful for being there to listen to Sage Sukha. 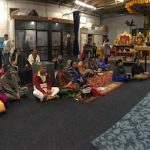 Of the 18,000 Slokas, the five Stuthis are full of gratitude, Kunthi Stuthi explains gratitude in completion. Shri.Ramanujamji went on to explain that Kunthi faced a life full of misery and when even Bhagawan was about to feel sad listening to her problems, she said, that each time she was faced with a problem she would remember the lord and that made her come out of the misery. Hence she was thankful to Bhagawan for giving her miseries in the first place, such was her attitude of gratitude. Akin to how a doctor cures a patient through all possible ways, be it cutting the affected region, through bitter medicines and finally the patient is ever grateful to the doctor for saving his life, Lord Krishna does things to only alleviate the people. The lord has to satisfy Kala, Karma and Swabhava to get to a devotee and hence he may be delayed but he never abandons his devotee. Shri.Ramanujamji gave examples from the lives of great Mahans and Sadhus and encouraged everyone to perceive everything with gratitude and that will lead only to love and happiness. The final day satsang began with Sri.Prabhu and his daughters rendering the Astapathi. Shri.Ramanujamji started the discourse by sowing the seed of Krishna Prema. He explained that the opposite of fear is not courage but faith, as only faith can conquer fear. Where there is fear there is no love, its the negative expectation of future while faith is the positive expectation. Bhagawan focuses only on ones’s potential and nothing else and He answers even if called without devotion. In this current age and time, attaining Lord Krishna is the end goal and worldly ways are the means to achieve Him and not vice versa. When we serve with gratitude then there are no expectations and that gratitude becomes the base for transformation. Lord Krishna can verily be attained through gratitude, faith, love and compassion. The big question then was how to get there? Shri.Ramanujamji simply said, “Get connected to Lord Krishna somehow and that he will take care; think of him while doing anything and everything”. Bhagawan is Asuthoshi, he will be happy even if we fake bhakthi, over time he will bestow pure Bhakthi. 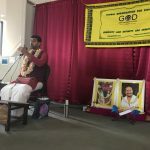 The simple steps to follow are to listen to his glory and stories ( Shravanam), talking about the lord, as name and form are not separate, its like quality of a substance cannot be separated from the substance itself. 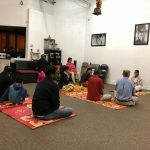 Shri.Ramanujamji encouraged everyone to sing the divine names and led a Mass prayer, with devotees chanting the names with full force and strength and the three day discourse came to an end with transformation process beginning inside each and every one.